The Overload Relay T2700 is intended for detection of power levels for protection, control or monitoring purposes. The T2700 will protect a generator from excessive active loads. 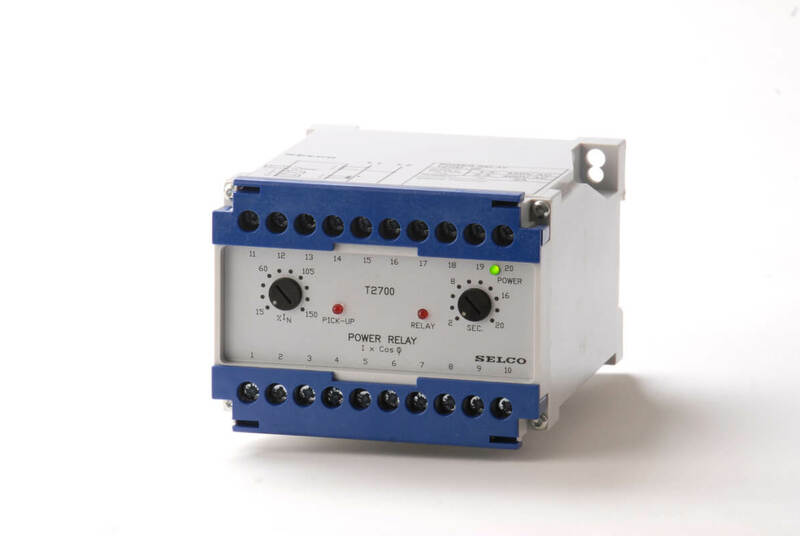 The T2700 Overload Relay will protect the generator from excessive active load. The T2700 is necessary to protect the prime mover and alternator against physical damage. The T2700 measures the current through an external 5A CT attached on phase L1. The phase angle (phi) is determined from the voltage measurement across L1 and L2. The T2700 calculates the active current as I x cos phi. If the active current exceeds the preset level (0.02 – 2 x I), the pick-up LED will ignite and the trip delay timer (0.1 – 10 seconds) will activate. The built-in trip relay will energize after the delay has passed, provided that the preset trip level was continuously exceeded during the time of the delay. Dials on the front facia provide easy adjustment of both trip level and delay. The LED based pick-up indication is ideal for testing the unit. Simplicity is the key to trouble free installation and service, as simplicity plays a key role in reducing the Total Cost of Ownership (TCO) for the complete supply system.